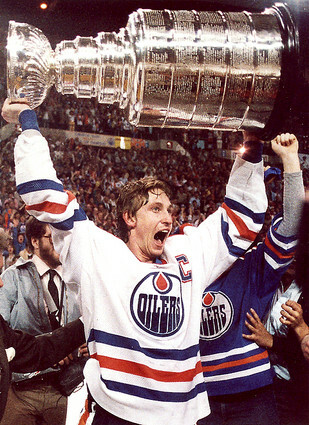 May 19 was the 30th anniversary of the Edmonton Oilers first Stanley Cup Championship. Beyond the fact that, as a nine-year-old hockey-crazed Edmontonian, I adored the Oilers (I recall praying that they would win the Cup that year, so that I could listen to the games in bed before I went to sleep) and knew every player’s stats, number, hometown, date of birth, favourite food, and brand of hockey stick. I also got to attend a good many games, as my father had Oilers season tickets. So, as fate and circumstances would have it, my father and I were in Section K, Row 14, Seats 3&4 when Dave Lumley scored into an empty net for the 5-2 win and 4-1 series victory over the New York Islanders. I remember the pre-game, and how loud it was, as I blew into my air-horn/vuvuzela contraption. I remember being very nervous about the game, as the Islanders goalie Billy Smith still seemed to be invincible and we were without our starting netminder, Grant Fuhr, having instead Andy Moog in net (backed up by Mike Zainer – a name that’s probably won me a bar bet or two). I don’t remember much of the game, other than the end – Lumley’s goal, the crowd spilling onto the ice at the final buzzer. I remember getting hit on the head with a red streamer, then grabbing it and trying to throw it on the ice myself. I don’t remember leaving the arena, other than my dad driving us through the celebration on Jasper Avenue in downtown Edmonton, thankfully exiting before we got caught in the mayhem (and, as memory serves, an overturned bus or two). One of the aspects that I remember most about that event, and that era of Oilers hockey for that matter, was how inevitable it all seemed. Of course, I had no context for how monumental that championship was – and the four others that followed over the next six seasons. My brother and I simply felt that we would take turns going to watch championship games with one or the other of our parents, and that was just the way it would be. As it turned out, we’d never return to those halcyon days again – perhaps why I have this nostalgia now. Indeed, in some ways, I can thank (or blame, as the case may be) the memories of May 19, 1984 for my interest in sport heritage, as my first major research study was about a nostalgia-based event based on that team. In any event, I didn’t want to let the moment pass without some acknowledgment. Sport can play a vital role in our personal biography and that night, 30 years ago, was certainly a marker in mine. By Gregory Ramshaw in Uncategorized on May 26, 2014 .